Since King Saul rebelled against God, the Spirit of the Lord left Saul; as a result, a demon had entered him. Thus, Saul became depressed and fearful. Saul’s servants identified the reason for his sudden change in behavior. Thus, they suggested that he have a good musician play soothing music on a harp whenever the demon tormented him. Saul immediately consented. “Behold, I have seen a son of Jesse the Bethlehemite who is a skillful musician, a brave and competent man, a warrior, discerning (prudent, eloquent) in speech, and a handsome man; and the Lord is with him,” one of the king’s servants referred David to Saul. Wow – what a résumé! Let’s go through it again, shall we? Sounds familiar, right? Here, we once again witness the Spirit of Excellence. Moreover, though David had already achieved quite a bit at such a young age, he never let it get into his head. It was not his boasting that got him to the palace. In fact, his gift made way for him. As stated in Proverbs 18:16 (KJV), “A man’s gift maketh room for him, and bringeth him before great men.” Likewise, we too should not allow pride to creep in our lives; neither should we push our way in. David perfected his craft. Soon after, God anointed it in a marvelous way. In addition, as specified in Proverbs 22:29 (ESV), “Do you see a man skillful in his work? He will stand before kings; he will not stand before obscure men.” Thus, it is no surprise that King Saul sent for David. Shortly thereafter, David began serving the king. Now, the king loved David very much, and David became his armor bearer. Then, the king requested Jesse to let David remain in his service since he was very pleased with him. From temporarily playing for the king, David was now the king’s official harp player; in addition, he was also given the position as the king’s armor bearer. A privileged, temporary position becomes a prestigious, permanent one. As you can see, David’s gift made room for him. 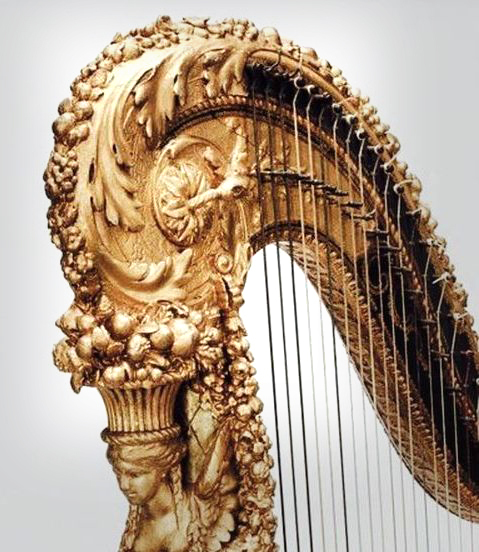 Whenever David played the harp, the demon would flee; as a result, Saul would feel better. As mentioned above, David took the time to develop his gifts. In Matthew 25:14-30, Jesus narrates a parable of three servants. Before going on a long trip, the master entrusts his money to these three servants. To the first, he presents five bags of silver. To the second, he hands three bags. To the third, he gives just one. Now, why did he not give them two bags of silver each? It would be a question that would very likely pop into one’s mind. After all, that would be considered equal, right? Well, the answer is found in Matthew 25:15 (NLT): he divided it “in proportion to their abilities”! Meaning, he knew what each servant was capable of. Thus, in this scenario, he gives each of them an opportunity. When he returned from his trip, he asks his servants to present what they had done with his money. The first one presented ten bags. He invested the money and earned five bags more – he doubled the amount he was given! Moving on, the second servant presents four bags of silver. He too doubled the amount he was given. Hence, the master applauds each of them, “Well, done my good and faithful servant. You have been faithful in handling this small amount, so now I give you many more responsibilities. Let’s celebrate together!”. However, the third servant steps forward with only one bag. Though the bag was safe, the master was furious that the lazy servant did not even bother on investing the amount in the bank in order to receive interest. The third servant did not value what he was given. As a result, the master orders to take away the bag from the third servant and be given to the first servant. In Matthew 25:29 (NLT), the master states, “To those who use well what they are given, even more will be given, and they will have in abundance. But from those who do nothing, even what little they have will be taken away.” This parable applies to tangible gifts, spiritual gifts, physical abilities, or opportunities given to you. Perhaps, it may even be the calling upon your life. 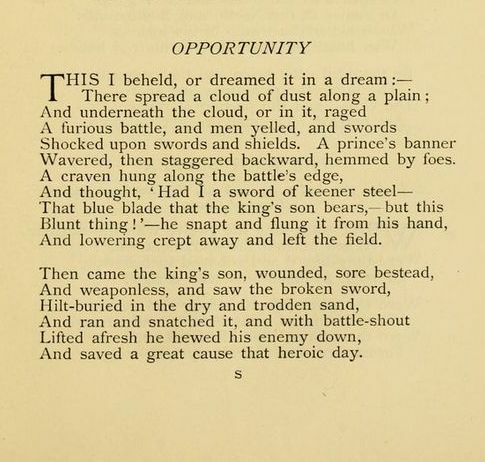 You simply must read one of my favorite poems “Opportunity” by Edward Rowland Sill. It speaks of a cowardly soldier who despises the blunt sword in his hand and compares it to that of prince’s. He snaps his sword and leaves the battlefield. However, the wounded prince finds the same broken sword. He grabs it and fights the enemy. Both the coward and the prince were given the same opportunity. However, the prince chose to seize the opportunity and won the war. A question God frequently asks is, “What is in your hand?”. He asked the question to Moses who held a staff. God used that very rod to split the Red Sea. He asked the same question to the disciples before feeding the multitude. He chooses to do miracles with what you already hold. Never despise what God has given you. It may be the very thing He uses to release your breakthrough. Always view it as an opportunity. You will be held accountable for what you are given. David chose to develop whatever he had been given. Seeing his faithfulness and diligence, God anointed David’s efforts and presented him with even more opportunities. Now, what is in your hand? What are you choosing to do with it? Stefanie Danielle Thomas is a determined girl chasing her dreams and following God’s perfect will in her life. In addition, she strives to be both “the jack of all trades” and “the master of many”. She is quite the multitasker (a modern renaissance woman some would say) – family, friends, church, youth girls, pursuing two degrees studying in two universities, traveling, music, art, baking, cooking, writing, gym, chores, volunteering, etc. Thought provoking and inspiring, and a much needed word for me Danielle! ‘Oppurtunity’- what a poem! Thank you so much for sharing! Beautiful Revelation Danielle Loved it.❤️ So good to see the way God is using you. Hello, Claudia, I am so happy to hear! I also glad that Lord brought it out for you at the right time! Love you! Hi Danielle, your post is so refreshingly tangible. I loved the uniqueness of how you brought out David’s resume & woven around it bringing out an apt message on the opportunities & what we choose to do. Connectivity of the poem is just wow!!! Amazing revelation Danielle…God chooses to do miracles with what i already hold. 1. I should never despise what God has given me. 2. It may be the very thing God uses to release my breakthrough. 3. Always I should take it as an opportunity. Very true Danielle! Every opportunity is God given, it may never come again! We should never miss an opportunity to do good. Thank you for being an inspiration and a blessing. Thank you Danielle!! It made me aware of my accountability to God for all that He has entrusted me with. I really enjoyed reading your blog. Thank you Danielle!! Love. Thanks for sharing dear Danielle. Profound. A great reminder Danielle. Loved the ease of the narration yet profound in many ways. I read it out aloud for all to hear. We all enjoyed it. You made it so easy to understand. Looking forward to the next one. Glad to hear, Aunty Marina! May the Lord anoint your pen even more! Thank you so so much, Dr. James! Wow! Great! Thanks for being soo open and careful, it gives pleasure to watch your talants! When Christ found me i was like this,full of energy and enthusiasm,wanted to accomplish a lot,but a lot of hindrances slowly put me down,but can’t break me all,now i really desire to fly like an eagle and to advance in most areas of my life for God’s glory! Thanks a lot for Your examle and ministry dear Dees and Pastors!! !aboundance in all Your ways!!! I happy that it inspired you, Aygun! Thank-you so much Danielle for the amazing message from God; and it also helped me to understand the importance to focus on what is in my hands to fullfill God’s plan for me. That was a Spectacular message Danielle. I understood that even though the Soilder broke his sword, the prince used it and won the war. In fact, I liked the parable of the three servants who were given bags of siliver coins based on their abilities and how the first and the second servant went back to the master with double of their investment. Finally, from this message I understood that I should use whatever little I have for GOD. I am glad that it has spoken to you, Ryan! Thanks for the blog Danielle , Enjoyed reading and it’s insightful. Beautiful and inspiring post, my darling…just like you …muah!